Q: What days are you open and what are your hours? We’re open 7 days a week and only closed on certain holidays. Weekday and Saturday hours are 4:00 pm to 2:00 am, Sunday is 12:00 pm to 2:00 am. For most ticketed events, doors open at 6:00 pm (not including most ticketed fundraisers/local events). Q: What is your address? Our mailing address is 103 Slade Lane, Warrendale, PA 15086. FOR GPS PURPOSES, use the address: 285 Northgate Drive, Warrendale, PA 15086 which will take you to our main entrance. Q: How do I get there? Click here for directions. Q: How do I join your email list? Click here to join, it’s that easy! Q: Do you take dinner reservations in the dining area? We only take dinner reservations on days when there isn’t a ticketed event and on Sunday-Thursday for parties of six or larger before 7:00. Half of your party must be present for us to seat you. Fridays and Saturdays are first come, first serve. Our private party areas can be booked in advance with an area party fee. Q: If you don’t take reservations on Fridays or Saturdays, why do I see reserved signs? The reserved signs are for those that have booked private parties in advance (and payed a fee). They could also be a special request from one of the Jergel’s partners or the band that is playing that night. Q: Do you serve food for ticketed events? We always serve food for our shows, you can order off of the regular menu. Q: Do we have to leave our table once we are finished dining for the show? No, you do not have to leave your table. You can remain there for the evening. Q: Do you have daily specials? Happy Hour is from 5-7:00 every day of the week with ½ price drinks and $2 off apps. 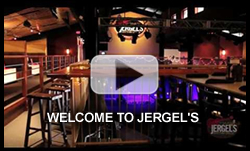 There are exceptions to the time of day based on various events held at the venue and is the discretion of Jergel’s to determine these times. There is no Happy Hour for ticketed events. Please check out our menu. We also have Chef’s Specials periodically so be sure to ask your server when visiting. Q: Are your shows 21+? You must be 21 years or older to attend any show unless accompanied by a parent or legal guardian. Q: Is your facility general admission for national shows? Most of our national shows are general admission. Local and regional acts are general admission (with exceptions). National/touring shows require advance ticket purchase either on our website or the day of the show (price increased on day of show). Q: Can we smoke inside? Cigars are permitted in the Cigar Bar, which is separately ventilated from the rest of the venue and there is an designated area outdoors for cigarettes. Pennsylvania law prohibits smoking anywhere inside the property (other than the Cigar Bar). Q: What hotels in the area would you recommend? Click here to visit our “Lodging” section for various packages with all of our hotel/motel partners. Q: Is the building handicap accessible? Yes, our venue is accessible by our central elevator. Please inform us about wheel chair requirements ahead of time so that we can best accommodate your needs. Q: What’s the best way to find out about shows at Jergel’s to stay up-to-date? Join our email list. To join, click here.